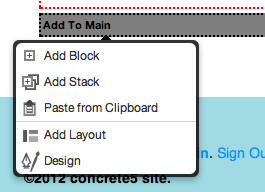 A block is some content or functionality you can edit from within a page in concrete5. Think of legos, these are the actual building blocks that go together to make your site. There are many types of blocks. Your concrete5 install comes with about a dozen basic blocks including the Content block, Survey, Guestbook, Slideshow, etc. You can find more blocks, both free and commercially supported in our marketplace. All your in-context editing is performed in Block Areas. These areas hold the content and functionality blocks that make up your web pages. Add Block lets you create a new block from the list of installed blocks on your site. Add Stack lets you place a set of blocks you've grouped together in the Dashboard > Stacks area. Paste from Clipboard gives you a simple way to copy existing Blocks and paste them around a site. First just click an existing block and add it to your Clipboard. Add Layout let you chop block areas into smaller columns. You should use them sparingly. Design lets you override the CSS for this part of the page. How do Blocks go together to make a site? Your site is a collection of pages arranged in a hierarchy called the site tree. Each page in your site is associated with a page type and theme. That combination of page type & theme defines parts of the page which can have editable content or functionality. These are called block areas. Inside any given block area, you may have many blocks. When you add a specific type of block to a specific block area, you have created an instance of that block. Most pages in your site will be built out of different blocks sitting in block areas.